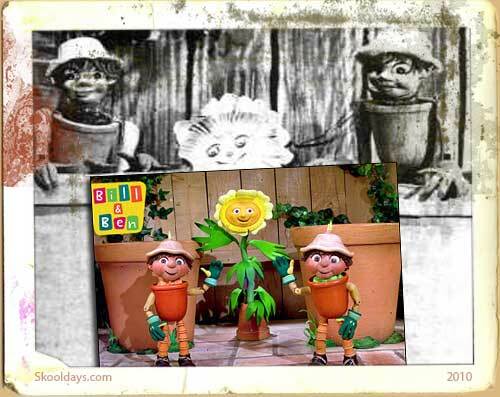 Bill and Ben the flowerpot men originally appeared in black and white certainly in the sixties as an effort from the BBC to help produce a few television programmes for children. As part of the Watch with Mother format it aired each weekday lunchtime and shared its slot with other children favourites such as the Wooden tops, Andy Pandy, Poggles Wood and Muffin the Mule. It also had others like Pinky and Perky sharing its time slot I seem to remember. The Flowerpot men were just that, made of flowerpots and they were either side of a sunflower called Weed ironically. I have to be honest I can’t remember any of the story lines but no doubt they taught some form of moral ethics for children 50 years ago. Now decades on parents and grandparents can watch the new flower pot men in high definition technicolour blu ray recordings. Has anything changed apart from a slight rejuvenated look? I’ve no idea as I’ve not seen the new Flowerpot men yet! This entry was posted in Saturday by Skooldays. Bookmark the permalink.